ON SATURDAY 11th MAY 2019, 11.00 - 5.30pm. Monies from the day will go 50/50 to Putley Parish Church and the Village Hall. The following have generously helped with the costs of this event. Please support them. Putley villagers and others have made contributions in lieu. Their generosity is acknowledged with thanks. 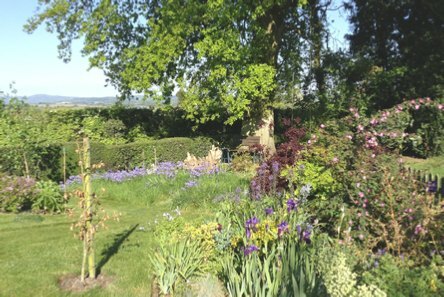 Visitors can enjoy glorious gardens in the Herefordshire village of Putley on Saturday May 11 and there's every chance they will find the place "pretty in pink." Year Five of Putley Open Gardens and our gardeners are already busy preparing for their visitors in the idyllic community near Ledbury. 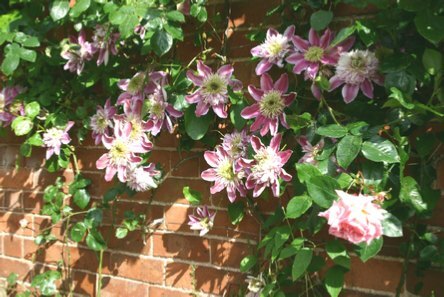 This year there are eight gardens adding to the variety which includes a garden laid out in the 1920s, by a chap named Capability (but not Brown) with its stunning rhododendrons and azaleas; a lovingly-tended cottage garden; a beautifully laid-out quarter-acre plot with themed borders; gardens with a proliferation of roses, wisteria and clematis and some with their "deliberate" wild corners with bluebells and cowslips. Putley is surrounded by orchards, so an additional treat may well be the sight of the cider apple trees covered in a marvellous mass of pink blossom. Visitors to Putley Open Gardens are also encouraged to explore delightfully-situated Putley Church. The carefully tended churchyard warrants a visit, with its (unique?) oak and teak War Memorial, a very fine medieval ll* Preaching Cross, recently restored with help from Historic England, specimen trees, the possibility of emerging wild flowers and entrancing views over the adjacent duck pond. 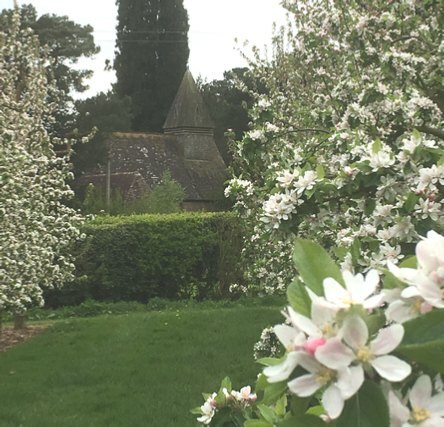 The gardens and church are accessible by well-marked footpaths through the orchards and pastures, providing a chance for visitors to experience Putley's beautiful countryside, wild flowers and wildlife as well as the gardens themselves. However there is parking adjacent to all the gardens with, perhaps at most, a three minute walk. The views straight into the orchards are what make our garden. In May they're a marvellous mass of pink. Our new water feature pays homage. Then there's the once-sludge-covered pond. Now cleared and aerated, success, it's enticed back the ducks! We've kept the borders near the house formal and elsewhere nature takes its course. We have been at Newlands for a considerable time. 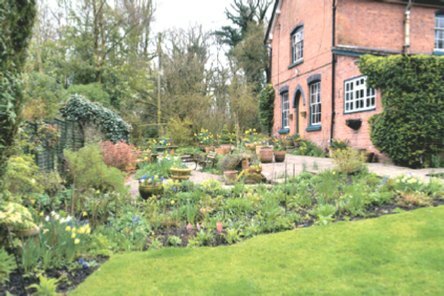 A small, established garden lovingly tended surrounds an early 19th century house. A cottage garden bordered by common land with mature trees, it has herbaceous borders, long established rhododendrons and camellias, ponds and gravel areas. There is a vintage summer house. The majority of trees in the churchyard were planted in the 1870s, many only introduced in the country 20 or 30 years earlier. One yew is over 500 years old. The wooden war memorial and the 14th century preaching cross are Herefordshire ‘one offs’. The village war memorial (1920), is possibly a unique example of the work of carvers Fowler and Brindley, who were employed on the Albert Memorial. There only two such wooden memorials in the UK. This is a new garden started just over a year ago. 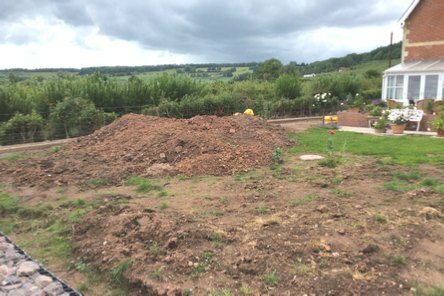 It is still in a developmental stage while the gardener becomes accustomed to what will grow in the local clay soil and the windswept landscape. 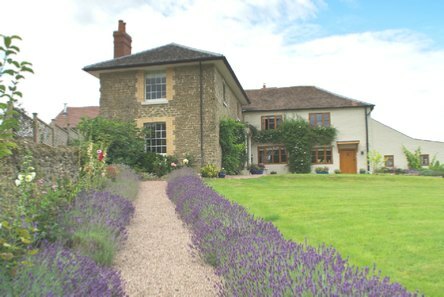 There is a lawn with borders by the house and a potager with raised beds at a lower level. See how the garden has changed since this photo was taken early last year. Our triangular quarter-acre has venerable oak trees at either end. Top Oak shelters the kitchen garden, Bottom Oak the swing and wild garden. In between are topiary and sculpture, gravel garden with box, lavender and heather beds, ponds, hydrangea and azalea beds. Themed borders surround lawn areas. The garden was laid out by Lancelot Riley (nearly Brown), son of John Riley of Putley Court, in 1921. 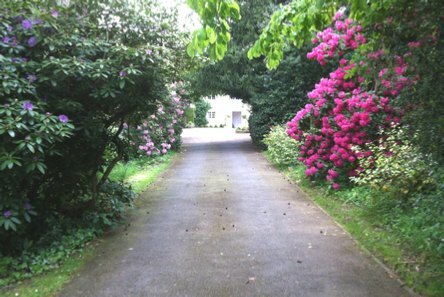 The rhododendrons and azaleas together with yew hedges are contemporary. We have added sculpture to the fore-garden and, to ease bending in the kitchen garden, sensibly high raised beds. Herbaceous and raised vegetable beds, lawn and mulberry tree. Ornamental and fruit trees underplanted with bulbs, cowslips, fritillaries and camassias. Paddock with small orchard, huge perry pear and ‘wild’ corner with dewpond. Wisteria, banksia rose, clematis and roses up trellis and trees. Margins deliberately weedy for our dormice and hedgehogs. The garden re-designed five years ago incorporates some of the earlier mature features. It is still, like most gardens, work in progress, aiming to be of year round interest. The front, walled garden is beginning to fill out. With parterre and rose garden. 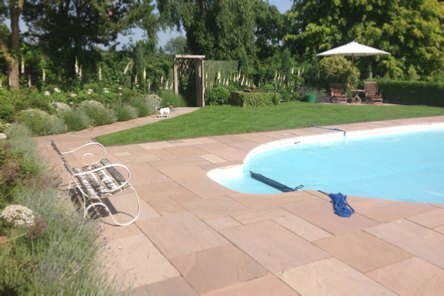 The swimming pool garden, three years old, is mostly evergreen and to stop debris blowing into the pool. The kitchen garden (potager) flourishes.